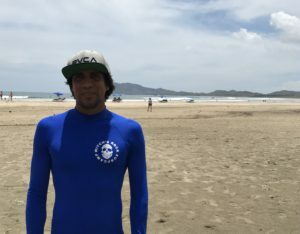 When you come to Witch’s Rock Surf Camp, we want you to have life-changing experiences, make new friends, and make the most of your time in Tamarindo. We know our service plays a big role in that. In a series of posts, we’ll introduce some of the individuals who make up the best staff in the world. Today, we chat with Johan Rojas Acuna, a surf instructor who has the best desk in the world—the ocean. Johan started with the camp about 15 years ago and is currently the surf captain for the surf programs. How did you get involved with WRSC? It started with meeting Joe in the water, surfing the river mouth. I left home at 15 and had worked as a boat captain in Drake Bay, on the Osa Peninsula, for about 6 years. Down there surfing is not too strong. Tourists come more to fish and visit national parks. I moved and got a job on a sailboat. I was 22 years old. One day I was surfing and hanging out with this blonde guy with long hair, Joe. He told me he had a business, but we didn’t talk much about it. Then one day I was trying to get a ride back to Tamarindo from the airport in Liberia. It was around 9 a.m. and I needed to be back for a 1 p.m. tour on the sailboat. I saw Joe at the airport and I asked him if he was going back. He was headed to Coco Beach, but he invited me to a party at his house later that evening with his family. It was only the second time I had met him, but we hung out that night and had a good time. He asked me to come to his office the next day and he offered me a job fixing boards and teaching people to surf. Did you know how to fix surfboards or teach people? No. I was a captain, so I knew a lot about the ocean, working boats, tying knots. I knew a few words in English but I did not speak it that well. 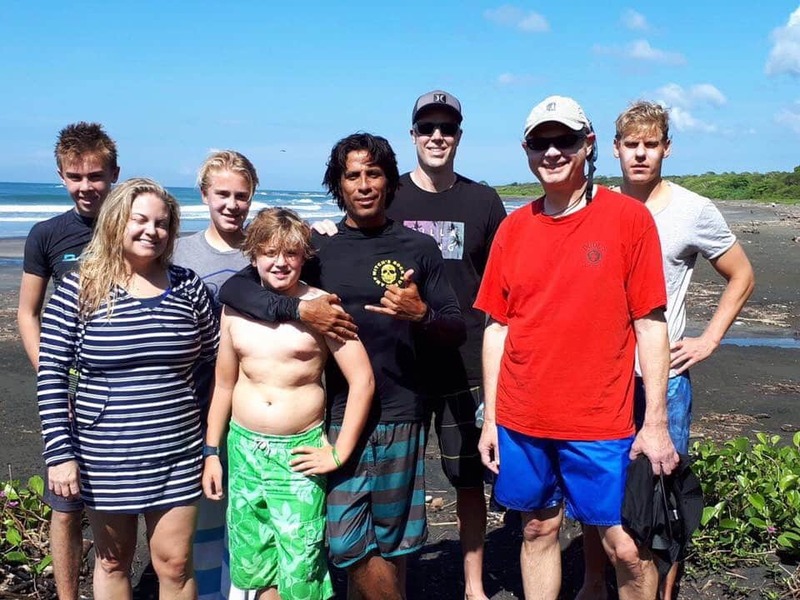 But Joe said that he needed someone—a local guy—to work in the surf camp. I thought, “what a job!” I had no idea that this was exactly what I had been looking for. It was like getting into a school. 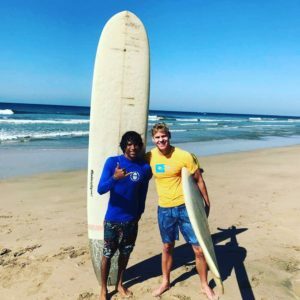 I could learn English, learn to fix boards, focus on surfing, hang out with surfers, and get paid to do it! That’s how I moved to the camp. I have been so happy. 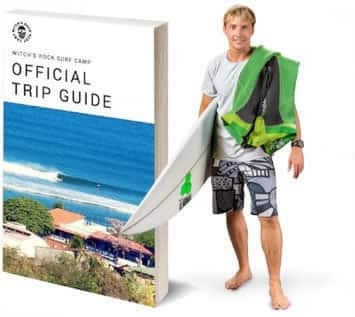 Oh wow, I never thought people would listen to what I know about surfing—what I learned on the street or I learned by traveling or I learned just be doing it for 20 years. If you’re a surfer and you’re passionate about surfing, you want to share the experience. I remember how hard it was to learn to surf. I remember how happy I was the first time I stood on a board. When I teach someone and see them get their first wave, then I know I want to keep doing this. They paddle or run up to me to give me a hug or high five. They cheer and smile like crazy! It doesn’t matter if it’s a child or a guy who is 65 years old. Everyone has a good time. Aside from seeing someone catch their first wave, I really love the time when we’re not surfing. We’re just spending time in the water. We might be discussing the theory of timing or turning, talking about a wipeout, or just hanging out. How do you deal with people who have fears about surfing? First, I always try to remain very calm. We talk about their fear and we go in the ocean little by little—starting off in the whitewash and only moving further once they are comfortable. It is good to always encourage the guests to push themselves, to face their fears, and to overcome them. What is the most important thing for a new guest to know? Safety is number one. Guests should always listen to the safety instructions. That’s also why we a recommend that new surfers sign up for a professional lesson—not from a partner or a friend—for their first time out. Other than that, guests should just try to stay active in their everyday lives, and, most importantly, learn to swim! Which break is your favorite to surf? I personally love Playa Marbella—for the barrels, the black sand, and the beautiful setting with palm trees. Why should people visit Witch’s Rock? 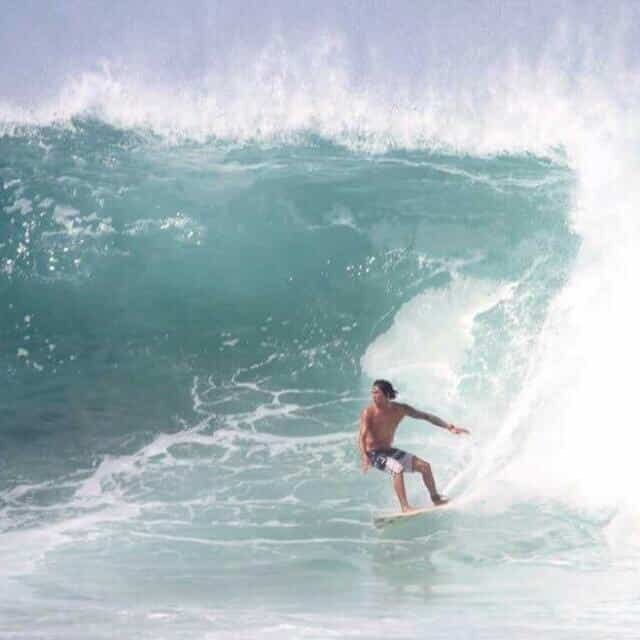 their skills or ripping it up at breaks up and down the Guanacaste coast.